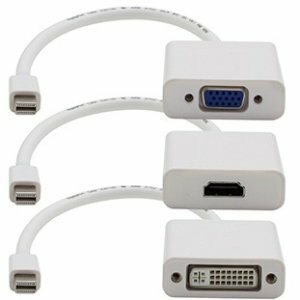 MDP2VGA-HDMI-DVI-W 20.00cm (8.00in) White Adapter is the perfect adapter bundle to go with your MacBook or other mini-displayport ready device. With adapters for mini-displayport to VGA, HDMI and DVI, you have adapter you need to connect to just about any display, project or TV at hand. These sleek black devices will blend seamlessly into your high-tech setup. If you have a Lenovo ThinkPad, Microsoft Surface, or other black mini-displayport ready device, check out MDP2VGA-HDMI-DVI-B.